Taken is released in the US today! It feels like only a little while ago that Fated was coming out, but now book 3 in the Alex Verus series, Taken, is out in the US! As always, you can read more about it here on the website and there’s an extract up too. With Taken now out, we’re finally getting to the point where we’re almost up to date – I finished the last changes on Taken only a few months ago (whereas when Fated was released I hadn’t touched the thing for a year or more). 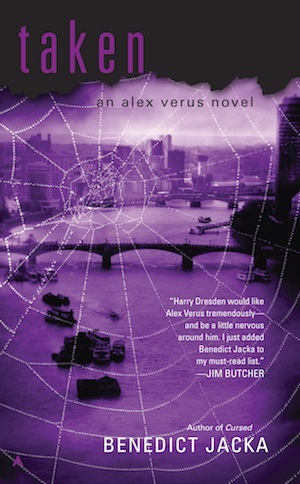 Right now I’m spending all my time on Alex Verus #4, but more on that later! 6 Responses to Taken is released in the US today! Ours should be arriving any day in the mail! We are excited to read it! 33% done and the novel does not disappoint. Arrived on my kindle at 1 AM today. Great mystery so far! On my Kindle, looking forward to having a chance to read it! Finished the novel, a great read and maintains the high standards for the series! I have my American copy of the book ordered and I am sure it will be winging its way to me any time now. I bought the first two books when I was on holiday in the US earlier this year and actually prefer the US covers, hence why I didn’t get the UK copy even though I am over here. Can’t wait! Excuse me while I keep crying in London till Thursday… then I’ll run to the bookshop.